The season opens with Ayub Khan Din’s East is East and that’s not all we have for drama lovers. With the timeless classic Rebecca from the internationally renowned Kneehigh Theatre Company and the fifth instalment from the Touring Consortium Theatre Company, Aldous Huxley’s Brave New World. 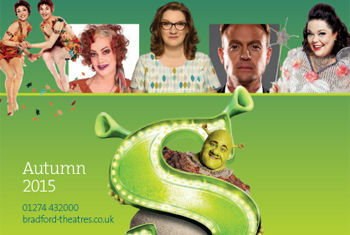 Shrek will be taking ‘Ogre’ the Alhambra Theatre from 9 September for three weeks and following that a string of top musicals including, Annie starring BBC’s Strictly Come Dancing judge Craig Revel Horwood, Priscilla Queen Of The Desert starring Jason Donovan and Hairspray with ensemble cast including Tony Maudsley, Claire Sweeney and Peter Duncan. There is also a welcome return of a musical theatre classic Jesus Christ Superstar. Britain’s national dance company Rambert return, bringing the rock‘n’roll swagger of the Rolling Stones to life in Rooster. Global phenomenon Les Ballets Trockadero de Monte Carlo are back in Bradford and Northern Ballet perform Emily Brontë’s romantic masterpiece Wuthering Heights as well as their latest ballet for children, Elves & The Shoemaker. If that wasn’t enough we have bumper seasons at St George’s Hall, King’s Hall in Ilkley and the Studio, with top comedians: Sarah Millican, Tim Vine, Justin Moorhouse and Dara O’Briain; plus music to suit all tastes with The Proclaimers, Bay City Rollers: starring Les McKeown and Jools Holland and His Rhythm & Blues Orchestra . There is an array of family shows with; The Basil Brush Show, What the Ladybird Heard, Mister Maker, The Scarecrows’ Wedding and Dinosaur Zoo. Have we forgotten anything? Oh yes West Yorkshire’s biggest panto Jack and the Beanstalk starring Billy Pearce, Lisa Riley, John Challis and Jake Canuso. “The autumn season at Bradford Theatres promises to be a very exciting and busy time. We continue to host a vibrant and diverse range of shows and events this season. East is East, Monday 31 August – Saturday 5 September, Alhambra Theatre. East is East is a timeless family story, with all of the wit, laughter, rivalry, tension and drama that make up family life. This production, direct from London, stars Pauline McLynn (Father Ted, The Knight of the Burning Pestle for Shakespeare’s Globe) and Simon Nagra (Dara and Rafta Rafta for the National Theatre), as well as a host of the finest British acting talent completing the cast. This critically acclaimed production of Ayub Khan Din’s modern comedy classic promises to be unmissable. Join our unlikely hero and his loyal steed Donkey as they embark on a quest to rescue the beautiful (if slightly temperamental) Princess Fiona from a fire breathing, love-sick dragon. Add the diminutive Lord Farquaad, a gang of fairytale misfits, and a biscuit with attitude, and you’ve got the biggest, brightest musical comedy around! Featuring all new songs as well as cult Shrek anthem I’m A Believer, Shrek The Musical brings all the much loved DreamWorks characters to life, live on stage, in an all-singing, all-dancing extravaganza. Join the adventure. Auctioneering star of the huge hit TV show, Storage Hunters, brings his live comedy debut to the UK! Lucy Kay who shot to fame on last year’s Britain’s Got Talent, will entertain and delight with her favourite tunes from the worlds of opera, jazz and musical theatre. Annie, the world’s favourite family musical, comes to Bradford for one week only, starring Craig Revel Horwood, the BBC’s Strictly Come Dancing judge, as the tyrannical Miss Hannigan! Birds of a Feather star Lesley Joseph will be playing Miss Hannigan on Saturday 3 October. Encounter and Tristan and Yseult. Rebecca is timeless; the book beloved by generations and the iconic Alfred Hitchcock film a classic of the genre. Now Rebecca bursts onto the stage! Emma Rice, the award-winning director, has created a spellbinding new production of Daphne du Maurier’s masterpiece which conjures Cornish romance and theatrical magic. Based on the smash-hit movie, the feel-good international hit sensation Priscilla is the heart-warming, uplifting adventure of three friends who hop aboard a battered old bus searching for love and friendship and end up finding more than they could have ever dreamed of. Starring Jason Donovan. Starring Diane Keen (The Cuckoo Waltz, The Ruth Rendell Mysteries and Doctors) and Graham Cole (The Bill). Starring Matt Monro Junior Celebrating the life and music of the legendary Matt Monro – 30th anniversary tour. Britain’s national dance company brings the rock‘n’roll swagger of the Rolling Stones to life in Rooster. Sharp suited, snake-hipped men and strong, sassy women perform virtuoso courtship dances to some of the Stones’ most famous tunes, including Not Fade Away, Paint It Black, Sympathy for the Devil and Little Red Rooster. The programme also includes Terra Incognita, a piece about exploration and migration created by leading choreographer Shobana Jeyasingh. Completing the line-up, Dark Arteries. Free post show Q&A: Wed 21 Oct, with Mark Baldwin, Artistic Director. The most famous songs of the Golden Age of Hollywood are recreated live on stage with award winning singers and dancers. Special guests are dance professionals Trent & Gordana and Robin & Anya from BBC’s Strictly Come Dancing, who will wow the audience with their glamorous costumes and ballroom skills. Puttin’ On The Ritz takes you on a wonderful musical journey and features music from George Gershwin, Irving Berlin & Cole Porter. Come and join your ultimate arts and craft hero Mister Maker, for his first ever live theatre tour. Hurtling through the classical ballet repertoire with their inimitable blend of skill, grace and a wit as sharp as scissors en pointe, The Trocks have been a global phenomenon since they formed in New York in 1974. Enjoy show-stopping Swan Lake (Act II), Merce Cunningham-inspired Patterns in Space, Go For Barocco, a satire on Balanchine’s choreography and the delightful Don Quixote. Free post show Q&A: Tue 27 Oct, with members of the company. Dare to get up close and personal! Now introducing the Tyrannosaurus Rex to the stage, Dinosaur Zoo brings these awesome prehistoric creatures to life as you’ve never seen them before. Dara O’Briain: Crowd Tickler – Friday 6 November 8pm, St George's Hall SELLING FAST! To You I Dance: A gala performance in honour of Dorothy Stevens MBE - Saturday 7 November 7.30pm, Alhambra. Local young performers from dance schools. The smash hit musical comedy Hairspray is touring the UK and Ireland with a brand new production, guaranteed to have you dancing the night away! Starring Tony Maudsley (ITV’s Benidorm) as Edna Turnblad, Claire Sweeney (Educating Rita, Chicago) as Velma Von Tussle, Peter Duncan (BBC1’s Tumble) as Wilbur Turnblad, Brenda Edwards (Chicago, We Will Rock You, X Factor) as Motormouth Maybelle and Freya Sutton who will reprise the role of Tracy Turnblad. Northern Ballet perform Emily Brontë’s romantic masterpiece to live music by Golden Globe and Academy Award nominated Claude-Michel Schönberg (Les Misérables, Miss Saigon and Northern Ballet’s Cleopatra). Immerse yourself in Cathy and Heathcliff’s turbulent love affair as the ‘best dance actors in the world’ (Dance Europe) capture the spirit of Wuthering Heights and the untamed beauty of the Yorkshire moors. After the success of Three Little Pigs and Ugly Duckling, Northern Ballet present their latest ballet for children, Elves & The Shoemaker. Recently adapted for TV by CBeebies, don’t miss your chance to see the Elves live! Christ Superstar has some of musical theatre’s most legendary songs including I Don’t Know How To Love Him, Everything’s Alright, and Gethsemane through to, of course, Superstar. Leading performer Glenn Carter returns as Jesus, musical theatre star Tim Rogers, plays Judas Iscariot, while X Factor finalist Rachel Adedeji stars as Mary Magdalene. Based on the book by Julia Donaldson and Axel Scheffler. Starring Stephen Triffitt, the world’s No 1 Frank Sinatra – celebrating the centenary of the greatest singer of the 20th century. Aldous Huxley’s ground-breaking novel, bursts into life in this wonderfully witty world premiere adaptation by award-winning playwright Dawn King, directed by James Dacre with original music by These New Puritans. Welcome to the future, where a genetically engineered class system has finally brought order and stability to the world. The ultimate tribute to one of rock and roll’s most remarkable groups. Replicating perfectly the power and subtlety of Fleetwood Mac at their brilliant best. Ballerina Productions presents Christmas Dreams Charity Performance, Saturday 12 December 7.30pm, St George's Hall. Local dance groups perform. West Yorkshire’s biggest and most spectacular pantomime stars Alhambra Theatre favourite Billy Pearce, along with actress and television presenter Lisa Riley, John Challis (Only Fools and Horses) and Jake Canuso (Benidorm). Jack and the Beanstalk is staged by Qdos Entertainment, the world’s largest pantomime producer. The timeless film will be shown on a large screen and accompanied by a live, professional orchestra. Andy Williams Christmas Spectacular starring The Osmonds - Friday 18 December 7.30pm, St George's Hall. Featuring nostalgic footage of the legendary Andy Williams from Christmases past with special guests Jimmy Cricket and The Moon River Singers & Dancers.